Stepping into the Information Era, we do almost every task on a computer, such as reading news, listening to music, and communicating with others. In the last few decades, the invention of social media has made the communication much easier. For example, just by tapping on the screen of a smartphone, we can upload our status and check newsfeed from other people on Facebook. There are many others social media platforms such as YouTube, Instagram, and Snapchat; they are all very easy to reach and use. Look at the picture below, how many social media accounts do you have? I counted mine, despite those that are not in the picture, I have ten social media accounts in use at the same time. Plenty of us all have various social media apps and we probably do not use them in the same way. When I browse newsfeed on my phone, I see some of my friends posting same pictures on each social medium. However, they describe the picture differently. Here is an example from one of my high school friends, Michelle. She post a video of making several function graphs into a heart. At the first time when I saw the two posts, I was a little bit confused: why did she describe the video so differently? Is she a different person on Instagram than on WeChat? Then I started to wonder: did I do the same thing as she did? Am I a different person on each social medium? The picture above includes the words that I use to describe my online identity. On each of my three major-use social media apps: Facebook, WeChat, and Weibo, I only show part of my identity but never all of it. Here, I am going to show you how I am a different person on these social media sites. First, I use English. 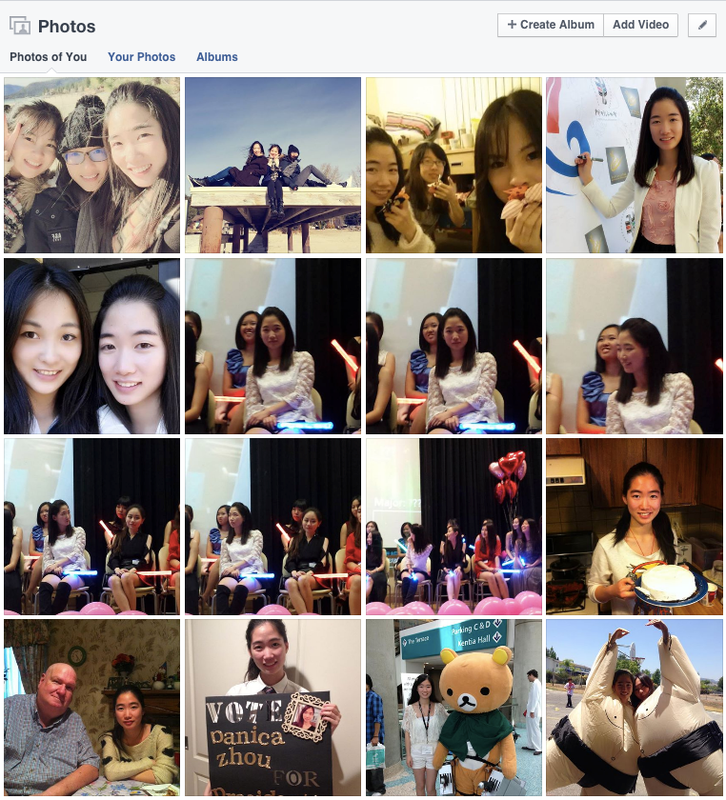 Did you notice I use my English name “Danica” instead of “Danxin” which is my Chinese name? Second, my profile picture is me opening my arms in front of the U.S. Capitol. 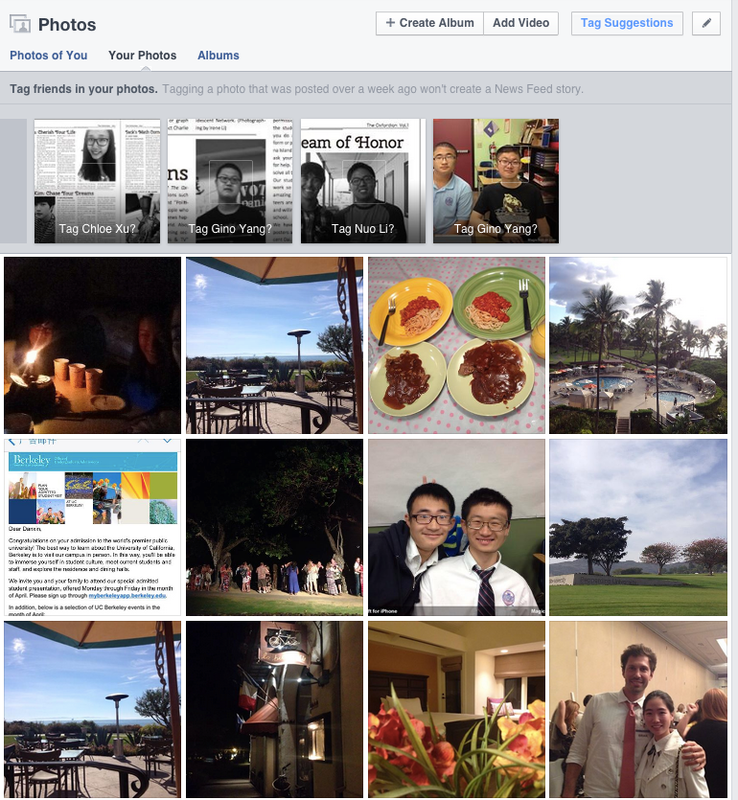 Third, my Facebook friends all know that I am a UC Berkeley freshman from LA, South California. All the pictures are about my daily life. However, I, myself, do not post many selfies on Facebook. But I do post scenery photos and pictures of my friends. Almost all the pictures of me are post by my friends. First, different from Facebook, I use Chinese on WeChat. 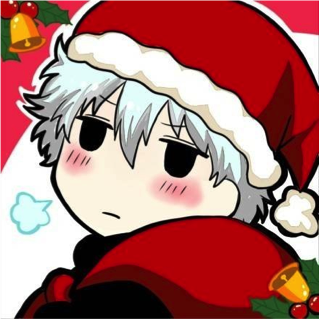 Second, my profile picture on WeChat, instead of a self-portray, is an icon of the main character from an anime called Gintama. I am more active on WeChat than on Facebook. 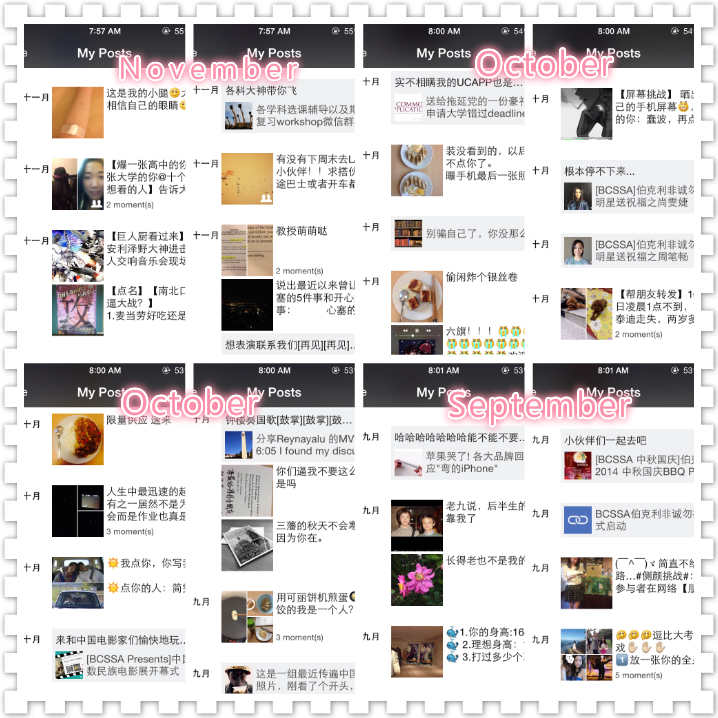 On average, I post eight pictures every month on WeChat. All the pictures are about my daily life. However, I post more pictures of myself on WeChat than on Facebook. Most of the pictures are about about food. First, like on WeChat, I use Chinese on Weibo. Second, my profile picture on Weibo is also an icon of an anime character, but from a different anime. Third, although I use Weibo very often, I do not write many original posts. Most of the time I repost other people’s posts. 2/3 of my original posts are about movie stars and anime. Each social medium site aims to different customers and therefore have significant designs. Facebook primarily provides online social networking service for people to strengthen contact with their friends from reality. We need to provide genuine personal information to register a Facebook account and some of the information will show on our homepage. WeChat is an app that allows people to text and send voice messages to friends. People can also share pictures with texts or just texts on it. Like Facebook, we also need to provide an email address to register a WeChat account but WeChat does not require our real name. 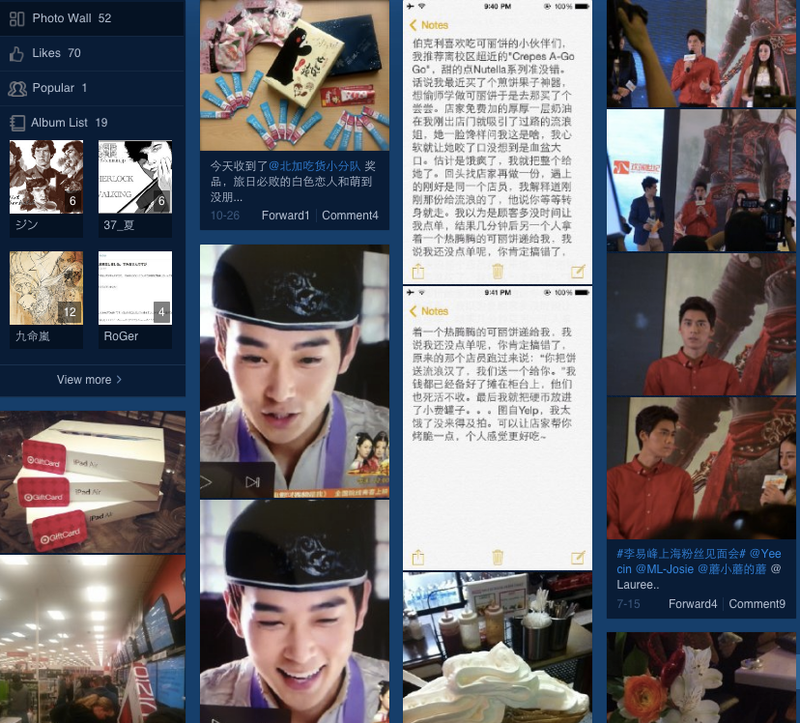 Weibo, which is a microblogging website, is a platform for everybody to share anything anonymously. It does not reveal our offline identity. You can see that I use a nickname “沧沐沐沐沐” (“cangmumumumu” which does not relate to my real name or mean anything) instead of my real name. Therefore, people can share things that are totally about their interests regardless of how their family or friends will look at them. We all have different groups of audience on each social medium and the audience affect the contents we share. My Facebook contacts are all the friends whom I made in the U.S. Most of them are Americans or they have lived in the U.S. for a long time. Therefore I choose the things that may interest “American” to share on Facebook and I only use English. 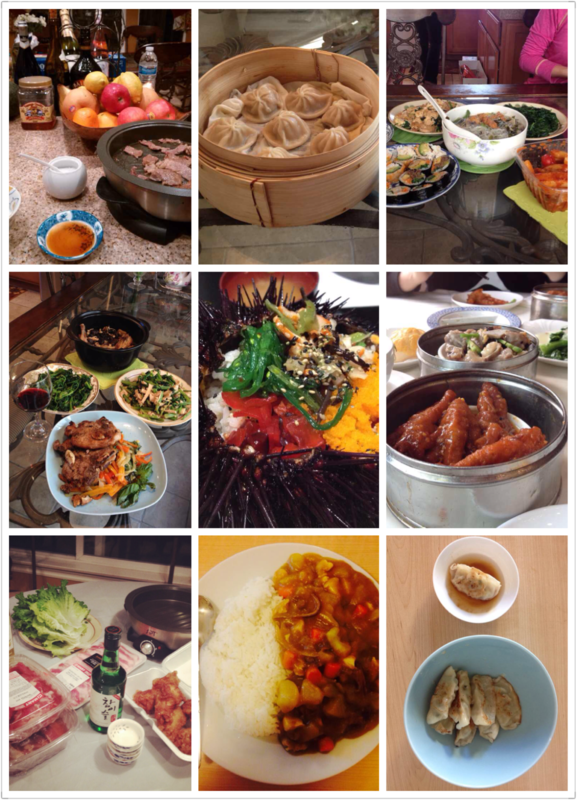 My WeChat friends are my family, relatives, friends in China and Chinese friends I made in the U.S. Since I know them in person, I share about my daily life. Weibo is a microblogging website. I follow people who share common interests with me and put them in nine categories: funny news, anime, food and crafts, discount information, celebrities, and fan clubs. I also have some followers but I do not know most of them in person. Therefore, I post and repost things that are total in my interest. say about my offline identity? You are really quiet on Facebook, which is opposite to how you act on WeChat. Sometimes you are too annoying because you always “@” me on WeChat and Weibo. 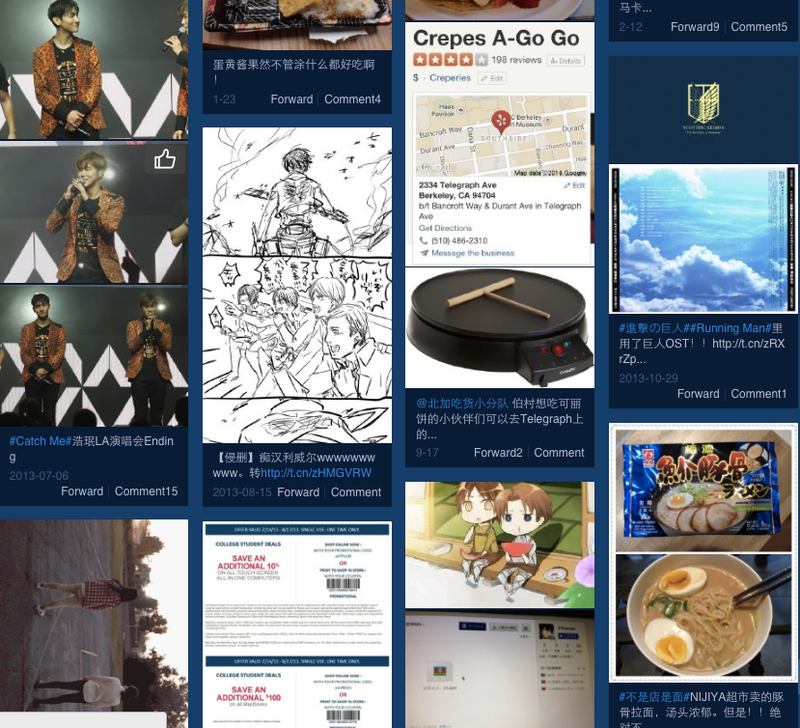 I don’t look at you Weibo very often because it is just about anime and other stuffs. “Quiet” and “annoying” are antonyms but my sister use both of them to describe me. Indeed, I AM a conflicting person because I show different personalities in different situations. If you only have contact with me in reality, you may think I am just a quiet college student. However, if you know me both online and offline, you will see all of my colorful characteristics: Chinese, optimistic, anime-passionate, and…. For me, acting differently on every social medium is just to express different pieces of myself. The identity shown in the “Facebook” piece may be significantly different from the “WeChat” piece but every piece is a part of me, a part of a genuine Danxin. Danmaku: or “bullet curtain,” is a commentary sharing system in which viewers can plaster comments directly on top of an uploaded video. Below is one of my favorite videos from a Chinese danmaku website. It is a fan-made music video for a Japanese anime named Gintama. First, I can instantaneously share my thoughts with other people and they can respond to my “danmaku,” too. When I send my danmaku comment, it will automatically show on the screen along with other people’s. I read them when I am watching the video and sometimes comment on a danmaku by sending a new danmaku. In that, we are chatting with each other and . Second, danmaku helps clarify points made in the video. For exampe, in informative videos such as a video that demonstrates a scientific theory, audience like me may have hard time understanding it. Some danmaku in a straightforward language will make lucid explanations that are easier for us to understand. Also, when we watch videos in a foreign language, some danmaku will point out mistakes in subtitles. I can learn a lot from danmaku. Last but not the least, danmaku makes videos funnier. Sometimes it is even more fun to read the danmaku than just watching the videos. Some people leave hilarious danmaku that is even more amusing than the video itself. When watching entertainment programs such as talk shows, I always go to a video website that has danmaku system.